Anne Coray’s poems are quiet epiphanies. She is at home writing about nature, art, mortality, history and myth. Wind is her most insistent metaphor—appropriately so for a poet who lives on a remote lakeside in southwest Alaska. She wants a language that can contain the wind, and often finds it—sometimes a gentle breeze, sometimes a tempestuous storm. 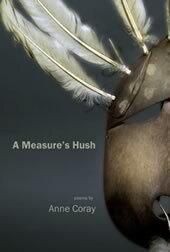 I’m very happy to have A Measure’s Hush on my poetry shelf. Coray is a poet who lives with wind and knows—however much the roots of things might tunnel and take hold—we will be borne off. Her new poems move through depths of elegy: the green scrub and drought of southwestern Alaska; the loss of a brother; meditations on paint and richnesses of gray, on language and everything it cannot capture. She is always attentive to the way the world resists vision. Snow falls on snow, a white bird rests in a white field, the ground does “not rise in greeting.” Through a radiant patience, Coray is present for those moments when something cracks and the air spills into crystal ash, the fern in the rain “breathes the silver message.” Without self-pity, and with immense trust, she shows us, sometimes quietly, how death arranges us to live. From the boat’s cabin top, I scanned Montague Strait in light diffused by high clouds, looking for blows. I spotted a white glittering, then another. It was the kind of haze made by a leaping whale when its body collapsed onto the water. We raced that way and found killer whales, took identification pictures of their dorsal fins and flanks, recognized them as Gulf of Alaska transients. The last time I’d seen them was four years before. They’d never been biopsied, but we knew that their calls differed from those of the local AT1 transients, so they might be from a completely separate population. That day, Craig wasn’t there to wield the dart gun, and my field assistant—my husband, John—and I had to do it ourselves. For the next two hours, the whales led us past Danger Island, into the gulf. John, more comfortable with a rifle than I was from his years in the Alaskan bush, shot three times without success. Out of Montague Strait’s strong current, the water calmed to a swell. In my impatience, I took the gun. John pulled the boat in close to the whales, and I sighted on an old female’s scarred saddle patch. Without thinking, I pulled the trigger. The dart hit the saddle patch and bounced out. She slapped her tail and dove. "We got a sample," I shouted, elated, when I pulled up the dart and saw blubber protruding from the tip. I gave John the gun on the next approach, and he darted another female. We’re getting pretty far out here," he said after I wrapped the third sample in foil and stored it in the cooler. "I think we should go back." I glanced toward the sound. We were at least four miles from shore now, and the whales were heading steadily south in the direction of Hawaii. As we drifted, we watched them disappear. An hour later, anchored up at Foxfarm Bay, just inside Cape Elrington, intent on processing samples and thrilled at our success, I didn’t notice John watching me. "I’ve never seen you that way before," he said. What way?" I asked, looking up. You were so angry and impatient, even rude at times, and then, suddenly, when you got what you wanted, you were ecstatic. A real Dr. Jekyll/Mr. Hyde thing. It was scary. I stared across the bay, where a sea otter lazily rolled and dove and brought up some kind of shellfish. Inside me, a nauseous feeling rose. I haven’t darted many killer whales since. It’s Craig who wields the gun. And there are whales we’ve never been able to dart, mostly sea lion hunters with torn fins. They sometimes approach our boat, curious, staring at us with inscrutable eyes. Once, a female grazed her body along the skiff’s side, her mouth open, showing rows of perfect teeth. "What are you saying?" I called after her as she swam away. Years ago, another whale drifted under the bow where I stood, looking down. She held a harbor seal in her jaws. Blood from the seal’s body throbbed. Science trains me to be detached in moments like those, but sometimes I’m angry or panicked in the field, when I can’t get what I want, what I must have. When I face the fact that I have no control over what’s invisible, what binds me so viscerally to my desires, what decides when the whales will find me. After several days without whales in Resurrection Bay, Craig and I overhear a radio conversation between tour boats. Killer whales are traveling along the rocky shoreline of Fox Island, fifteen miles from where we’re floating, our hydrophone down. They’re heading for the cape, out of the bay and out to sea. The skippers think they’re transients—the ones they call "the bad boys"—two large AT1 males that hunt harbor seals in ice floes off the Aialik Glacier. We drop our books and scramble to start the engine, call a skipper, get a location and direction of travel, and roar across the bay, coaxing as much speed as we can out of the Whale 2. When we spot the whales, we know right away they’re not the local "bad boys." Their fins are too broad and tall. As I slide the boat in parallel to the whales so we can take pictures, I scan photos of transient dorsal fins in the killer whale catalog. "Who do you think they are?" Craig asks, clicking off frames. "They’re awfully tolerant for Gulf of Alaska transients." The whales travel slowly, breathing for eight breaths, then diving for ten minutes. They follow a regular compass heading east, directly past Cape Resurrection, toward the sound. I stare at two blurry photos, then back up at the whales. They are Gulf of Alaska transients. They’re the AT30s." The pictures are poor, taken during a single encounter seven years ago in bad weather. We spend the next hour trying to get biopsy samples. Tour boats come to watch them, so we don’t dart. Darts miss. Once, a dart pops out of a whale but doesn’t take a sample. Another time, we’re too far away when they surface. Other times, they change direction slightly when they dive. I plead to them, to Craig’s amusement, as I position the boat. "Whales, please let us take these tiny samples. We’ll never have to do this again. It’s for your own good! We call out names for them, Chubby Rain and Heavy Rain. Despite our blundering, our absurd behavior, the whales let us approach closely again and again, and finally we have some samples. Floating off Killer Bay, we watch them disappear. "Don’t you wish you knew where they were going?" Craig asks. "Someday, with a little transmitter attached to them, we won’t have to wonder where they are. Now I can barely make out two distant black triangles among rolling hills of water, and I think of them unwatched by anyone for eight more years. They’re swimming off the edge of the known world, like hapless ships on ancient charts. They might dive right through the sea realm, resurface in some other, a realm of the supernatural. A young Sugpiaq man from Nanwalek, a tiny village in outer Cook Inlet, told me there’s a lake near his home that’s bottomless. A killer whale jumped into that lake, he said, dove to the bottom, pushed through and emerged in another lake. We cling to what we know. In response to Descartes’ mechanistic view of the universe, Blaise Pascal said, "The silence of these infinite spaces terrifies me. Science. It seems solid, but it’s mostly space, like a gill net I drop over the world. Two transients pass through its web, leave me holding a tiny sample, a pencil. A young scientist seeks mentors. I’ve had many. Bud Fay, my major professor in grad school, an expert on the walrus, showed me how a scientist could learn from and gain the respect of Native people. Hunters on St. Lawrence Island still remember him. Craig, other whale biologists, and those I know through their discoveries, their tenacity, their eyes that see and hear what others miss, are my biologist heroes. I met Mike, my last mentor, one afternoon at Chenega Village. He rode his four-wheeler down the steep ramp to the dock. In the vibrating silence after he’d shut down the engine, he sat and watched me as I pumped fuel onto the Whale 1. His look was inscrutable, no smile, his eyes shadowed under his cap. He could have been angry. Non-Natives were not always welcomed in the village. I tensed when he climbed off the four-wheeler and, hands in pockets, strolled over to the boat. "Seen any whales?" he asked, grinning. He was all sinew, brown skin, black hair, and a small, bowlegged frame. He wore a plaid wool shirt, stiff new dungarees, and wire-framed glasses. I knew he was considered a village elder, although I couldn’t tell his age. He coughed often, into his fist, turning his head away. I introduced myself, but afterwards, he’d show up at the dock whenever I was there and greet me, "Hey, Whale 1. He dropped bits of knowledge into our conversations, where he’d seen whales, how seals in the area were declining. I knew he hunted seals and fished for salmon but learned only from other villagers that he was one of the most respected elders in the sound and one of the last seal hunters in his village. I also learned he was dying of lung cancer. He’d gained his knowledge by roaming the sound in a boat in all seasons, watching. Since the oil spill, he’d assisted biologists on their projects—on octopus, harbor seals, subsistence traditions—and strove to involve his village in the science. I began to look for Mike when I came to Chenega, wandering to his house, inviting myself in for a cup of tea. Somehow, I felt attached to him. Our conversations were brief. But, after time, when he saw me, he hugged me. He teased me. When I told him what I wanted to be, he shook his head. "Why do you need to do that? You don’t need to go to school to do that. You just need to live out here. The smell of burning alder drifts up from Mike’s smokehouse. He’s gone today. He’s hunting seals. Molly Lou and I anchor the boat in front of camp. It’s sunny, but the wind’s come up, so we decide to take turns trying on the dry suit, snorkel, and mask and swimming through the eelgrass and kelp beds. Molly Lou helps me with the zipper. I hear words from Adrienne Rich’s poem in my head when I drop feet-first from the boat’s side into the sea. After I pull the black rubber away from my neck to release air, the dry suit clings to my body like loose skin. I place my face in the water and breathe through the snorkel, wheezing rapidly at first out of fear, and the sound is loud, like the breaths of someone dying. Eelgrass and kelp stream below me. Now my breathing sounds as if someone is breathing for me. I paddle. I make arcs through the water with my hands. Tiny sculpins wink in and out of battered fronds. As I swim along a rock outcrop, I look for seals. I glide along rocks and quiet my movements, searching the sandy bottom. My body blots out the light above me. I’m hungry. I search the whole island’s submerged perimeter. At times like these, I get closer to the water. Anne Coray is the author of Bone Strings (Scarlet Tanager Books); coauthor of Lake Clark National Park (Alaska Geographic Association); and coeditor of Crosscurrents North: Alaskans on the Environment (University of Alaska Press). Her poetry has appeared in The Southern Review, Poetry, North American Review, Connecticut Review, The Women's Review of Books, in several anthologies, and on the Verse Daily web site. She has been a finalist with White Pine Press, Carnegie Mellon, Rooster Hill Press, Water Press & Media, and Bright Hill Press. A two-time Pushcart Prize nominee, Coray is the recipient of grants and a fellowship from the Alaska State Council on the Arts and an individual artist project award from the Rasmuson Foundation. She lives at her birthplace on remote Qizhjeh Vena (Lake Clark) in southwest Alaska.